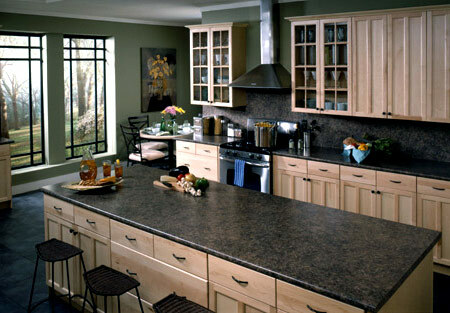 Granite is one of our most popular choices. Granite’s elegant look, low maintenance and high durability make it the preferred surface material by many high-end kitchen designers. With a wide variety of colors, granite is easy to integrate into any existing kitchen, bathroom, or office design, whether it’s traditional or contemporary. Similar to granite in many ways, engineered stone is a great option. The surface is made of crushed quartz and its nonporous surface is scratch and stain resistant, making it easier to clean. Engineered stone has the look of granite or marble, but with more color options. Engineered stone’s extra durability and low maintenance is perfect for kitchens, offices, and bathrooms. And like granite, engineered stone compliments traditional and contemporary spaces. Popular brands include Silestone, DuPont, and Cambria. Marble is a classic style that’s instantly recognizable. Marble is a softer stone, so it will require extra maintenance. But many find the elegance and luxury that marble brings to your home to be worth the extra effort. Kitchen by Hastings carries top quality White Carrara marble that adds value to any traditional or modern bathroom, kitchen, or office space. Solid surface is a great alternative to stone countertops. Solid surface is a synthetic material that is custom fit for a seamless appearance. Like engineered stone, solid surface is also nonporous making it easy to clean and resistant to mildew and allergens for hypoallergenic needs. Solid surface will make any stand out in a contemporary kitchen, bathroom, or office. 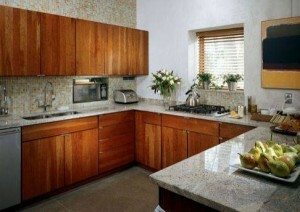 Custom countertops are available from Avonite and Corian. A laminate surface is an excellent choice for a quick and inexpensive way to refurbish your countertop. Often made to have a similar appearance to granite, marble, or tiles, a laminate surface is easy to apply and replace if damaged. Laminate is great for remodeling the kitchen or bathroom. Formica and Wilsonart specialize in laminate countertops. Wood is a great choice for adding a warm and rustic tone to your living space. Various seals and stains are used to make wood surfaces easy to maintain and protect. The organic look and feel of wood is perfect for adding a classic touch to any home design. Wood comes in a variety of thicknesses and looks just as good in a French country home or urban loft environment. Ceramic tiles come in hundreds of styles, designs and textures. Mix and match tiles together to make different patterns, the possibilities can be infinite. Regular cleaning of the tile and grout is required. Ceramic tiles help add a personal flair or exciting focal point to any room. Because of its extreme versatility, tile countertops can be made to fit almost any style or design. 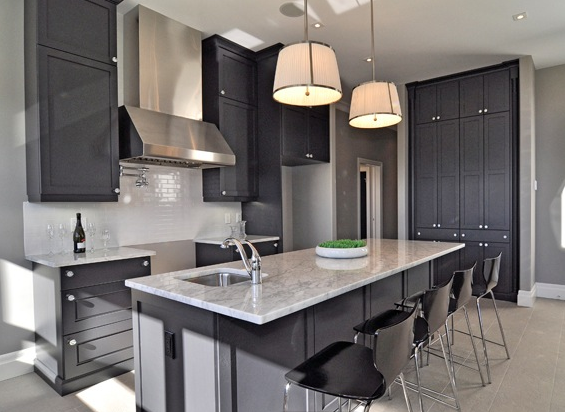 Similar to stone countertops like granite, soapstone is a heat resistant surface that has a smooth feel. While it is a soft stone like marble and requires more maintenance, it’s a great material for contemporary or traditional homes. Soapstone countertops add an elegant accent to kitchens, bathrooms, and offices. 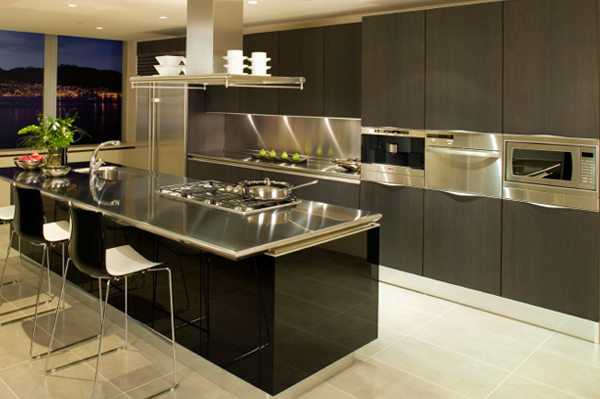 Highly durable and resistant to heat, stainless steel countertops are a sleek modern alternative to traditional design materials. Personalize it with a variety of finishes and brushed patterns and textures. They are great for contemporary kitchens. Concrete countertops are the latest trend. The most attractive attribute of concrete is how highly customizable it is. Different stains and colors can be used to create unique patterns and textures. Some designers have even integrated lighting and other design features in to their concrete countertops. Maintenance is similar to a soft stone like marble or soapstone, but concrete is highly heat and stain resistant.